One of the best parts of going back to school in my opinion has always been new school supplies! When I was younger and had a list of items to purchase I would spend so long picking out my items so that they looked just right and were the way I liked them. Well, not much has changed aside from the fact that in college there are no supply lists and instead you get to choose the items entirely on your own. Good thing I can drive because I don't think any of my family members would want to come with me list-less to shop for school supplies since they know that could take forever. Over the years I've discovered which school supplies I like most and tend to gravitate towards the same products year after year! I thought it could be fun to share these favorites with you! For me, I like to ditch the binders and instead stick to a folder and notebook combination. A matching color scheme makes these easy to spot and the duo helps to ensure that you don't just shove your handouts into your notebook with no rhyme or reason. Colorful pens pair perfectly with your agenda and if you couldn't tell, I love color coordinating! I'll be sharing my agenda organization but basically I choose a color pen for a class and stick with that all semester long and Le Pens are my go to and have been for years! Highlighters and black pens are a no brainer for me as are index cards for test studying and memorizing! Lastly, how cute is this backpack!? I have a post all about it tomorrow and can't get over how pretty and functional it is! Want to hear me ramble a bit more about each of these products and a few other favorites? Watch this video I made for y'all! 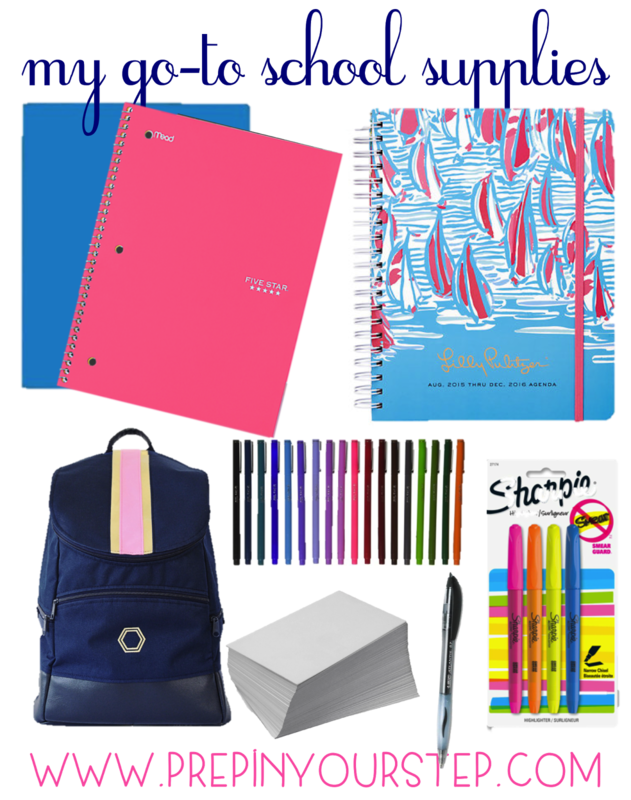 I would love to know what your go-to school supplies are! 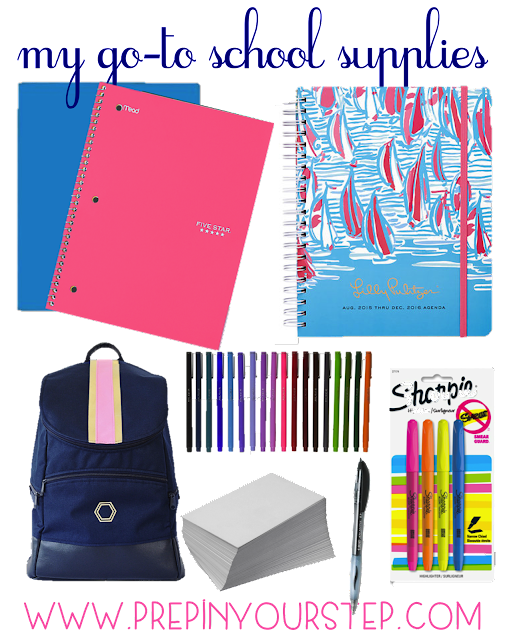 I have a Lilly agenda too and I can definitely relate to being picky about school supplies. I love going shopping for it. I love your idea of choosing a color for each class, that sounds like a great way to stay organized. I personally am going to have binders as well as folders and notebooks, but I'll probably use the binders mostly for re-writing my notes. I agree, I can spend hours shopping for school supplies! It is definitely my favorite part of the year. I'm starting to get more into using notebooks instead of binders, and I love the Five Star ones! Love your school supply list! I love having my Lilly agenda and then a bunch of binders! Same here, I'm a person who uses folders and notebooks rather than binders. Love your picks! I love picks! Can you do an organization video? I would love to be more organized this year! Our writing company maintains high level of customer’s satisfaction, only preofessional writers join our college academic writers team, see paper writing to find more information!